For some time, I’ve watched the War on Bottled Water with amusement. I don’t disagree with figuring out how to reduce waste, and so on and so forth, but the railing against bottled water per se struck me as not thought out very well. The major reason for my thinking is that I never heard any of the venomous railing against water extending to any other drinks that come in bottles. To my mind, it seemed that a Coke, hey, that’s okay, but if you start with one and take out the sugar, the caffeine, the artificial flavors, and CO2 you end up with water. Coke okay, water evil. Me, sometimes all I want is a cool drink of water. More often, I want something a little more. I’m very fond of those fizzy waters with a bit of essential oils in them, as well as iced tea. But I don’t want the sugar. I want an artificial sweetener even less, and often when faced with decisions, water is what’s available. When I’m traveling nearly anywhere, I think I’d rather have it in a bottle, thanks. The prejudice against water comes from thinking that it’s just water. Rarely is there such a thing as just water. The only just water there is is distilled (or in a pinch deionized) water, and that is itself special because it is unusual for something to be just water. The summary is that more than 20% of US water treatment systems have violated key provisions of the Safe Drinking Water Act over the last five years. The violations include sewage bacteria, known poisons and carcinogens, parasites, and so on. Mid-level EPA investigators say that the government has been interested in other things and just not enforcing things, and they don’t think change will happen. Security isn’t just going after terrorists, it’s basic thing. Like water. Top Security Stories of the Year? I have a couple in mind, but I’d love to hear your nominations. What are the most important things which have happened in information security in the last year? So after BNY Melon dropped a tape with my social security number and those of millions of my closest neighbors, they bought me a one year subscription to Experian’s “Triple Alert” credit monitoring service. Today, I got email telling me that there was new information, and so I went to login. Boy, am I glad to know they take my privacy seriously, because otherwise, their failure to fill out fields in their certificate might really worry me. I mean, I’m not annoyed that BNY Mellon treated my information negligently. Oh, no. I expect that. I am a little annoyed that having done so, they offered me a year of “monitoring” rather than prevention. I’m annoyed that it’s a year, when there’s no evidence that risk of harm falls after a year. And I’m annoyed that the company offering monitoring doesn’t bother to get the little things right. We have a comments feed. I suppose we should add that to somewhere sane. In the meanwhile, you should click here. We have smart commenters, and what they say is usually worthwhile. We think of botnets as networks of computing devices slaved to some command & control system. But what about human-in-the-loop botnets, where humans are either participants or prime actors? I’m coining this label: “social botnets”. Recent example: “Health Insurers Caught Paying Facebook Gamers To Oppose Reform Bill”. We found that male alarm calls are composed of an acoustically variable stem, which can be followed by an acoustically invariable suffix. Using long-term observations and predator simulation experiments, we show that suffixation in this species functions to broaden the calls’ meaning by transforming a highly specific eagle alarm to a general arboreal disturbance call or by transforming a highly specific leopard alarm call to a general alert call. We concluded that, when referring to specific external events, non-human primates can generate meaningful acoustic variation during call production that is functionally equivalent to suffixation in human language. 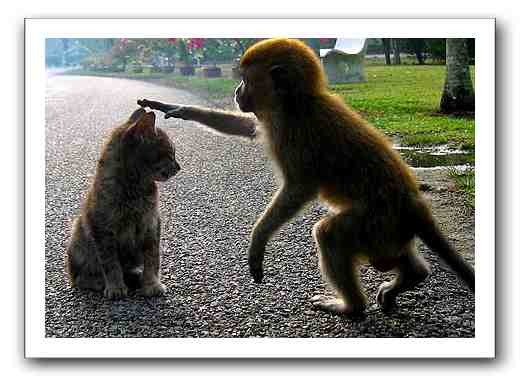 Photo: Macque monkey and kitten by Kaz Campbell.